In this article, I will explain what cat sitting is by first defining the service, then describing who the professionals are that do it, what exactly they do, and finally how they know to do it. After reading this, I believe you will come away with a much better understanding of the very important value of the service knowing that you can have the peace of mind while you are on vacation that your cat (and home) are in professional hands and being well taken care of. So what exactly is cat sitting? Cat sitting in its most basic sense is a service wherein a person comes over to your home to care for your cat while you are away, such as on vacation or business travel. It is the opposite of taking your cat to a boarding facility to be cared for exclusively at that location. The benefits of such an in-home care arrangement are myriad, chiefly that it allows your cat to stay in the comfort of their own, familiar home rather than being confined to a small cage in a totally foreign space, thereby also eliminating the stressful ritual of corralling your cat into their pet carrier and taking the long car drive to the boarding facility. No doubt there are certain instances which warrant boarding a cat, mostly revolving around medical reasons. However, in most cases, the benefits of in-home care far outweigh any convenience associated with keeping your cat at a kennel. The bottom line is that keeping your cat at home drastically reduces the stress on their mental and physical health. With that being said, in-home cat sitting care can be split up into two basic sub-types of service. It can refer to a caregiver coming over at a certain time of the day for specific lengths of time (30 and 60 minutes being common), known as “drop-in” visits. It can also refer to a person staying at your home for much longer periods of time, especially overnight (commonly referred to as “overnights”). Many pet sitting companies offer both services. However, for the purpose of this article, I will stick to discussing drop-in visits as not only are they a more common service, overnights usually involve a larger scope of duties that overlap significantly with housesitting, a much more comprehensive service. I’ll just finally say that although there are definite advantages to having a person stay at your home for extended periods of time, from a standpoint of pure privacy reasons, one of the primary advantages of drop-in visits is that the sitter is not as intrusive or burdensome on your home and its belongings: they don’t cook with your appliances, eat from your fridge, or sleep in your bed. In other words, it is not as much of a commitment on your part as the homeowner and therefore potentially significantly reduces the liability risk to your home property as well as of course your cat. What makes a cat sitter “professional”? Before we delve into what exactly professional cat sitters do, let me first tell you a little bit more about who they are in terms of qualifications and credentials. Professional cat sitters are passionate about cats and have extensive experience and knowledge of caring for a wide range of cat breeds and temperaments. They know feline behavior and health very well and are used to proactively monitoring the health of a client’s cat closely each visit, looking for signs of illness and prepared to take the cat to the nearest emergency veterinary clinic when absolutely necessary. But what truly sets a professional cat sitter apart from, say, your family member, friend, or neighbor, is the legitimate and tangible accountability that they possess. Professional cat sitters typically purchase and are covered under a commercial liability insurance policy and bonding policy, are thoroughly background checked (and can furnish proof), have a service agreement contract, a website that gives more information about their company (services, pricing, history), and numerous reviews and testimonials written by real clients publicly (Yelp, Google, etc.). Professional cat sitters are also typically members of a nationally recognized professional pet sitting organization (such as Pet Sitters Associates or Pet Sitters International); they may have a valid and current business license (for the highest level of accountability), possess current certification in pet CPR, and use professional pet sitting software for scheduling sittings and maintaining client records. As you can see, professional cat sitters take their job and the responsibility that comes with it very seriously. They understand the huge liability that is at stake with your cat and home. It is, in effect, a career for them. So what exactly do cat sitters do? As mentioned above, cat sitting by its very nature is care of a cat in it’s home, usually by scheduled drop-in visits. 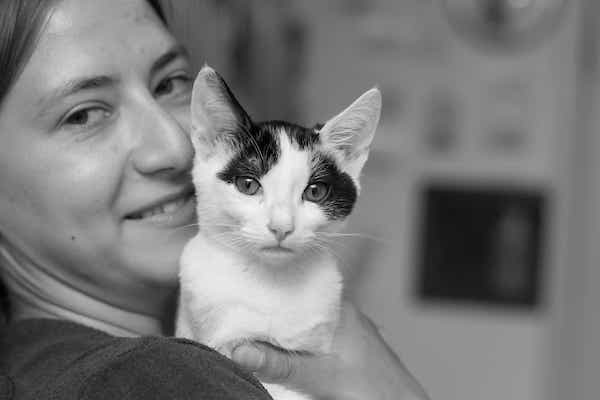 At those visits, the sitter performs all of the care duties you as the client have instructed them to do that maintains the consistency in care which ensures your cat’s physical and mental wellbeing and keeps them happy and healthy despite your absence. How will the sitter know to do all of this? Upon reading this list, you may be wondering how exactly the sitter will know to perform these duties in the precise manner you as the client want them to do it. Well, that is where the initial consultation (also referred to as the “meet and greet”) comes in. This meeting is where the sitter comes over to your home to meet you and your cat for two main reasons: firstly to see if they are a good fit and secondly to go over the entire visit care routine with you. It allows you to explain and demonstrate to the sitter exactly how you want things done and in which order so that the sitter is completely aware and focused on what they need to do and how to do it to your cat’s needs and your expectations. This meeting also provides the opportunity for you and the sitter to go over any questions or concerns either of you have related to the visit care routine and your home. To sum up, cat sitting is a very specialized pet care service that appeals especially to persons who are reluctant to bring their cat to a boarding facility for care but at the same time hesitant to just leave out big bowls of food and water, leaving for a few days and hoping for the best. And the credentials and contractual obligation of the sitter serves as a step-up in professionalism in care of your cat and home from even the most well-intended family member, friend, or neighbor, ensuring the highest level of peace of mind that everything is being well taken care of by a very experienced professional who does such work for a living. Hopefully you now have a better idea of what cat sitting is. This should also serve you well as a starting point for what to look for when attempting to hire the best cat sitter in your local area. Best of luck!